A blessed selection as Christening, Communion or Confirmation favors, these shimmering silver cross frames are heartfelt mementos appropriate for any religious occasion. And, they give you a wonderful opportunity to share a great photo of the special day. 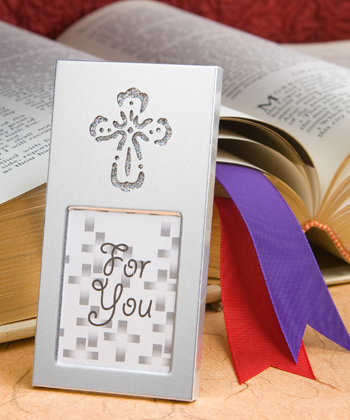 Each 2” x 4” silver metal frame has an intricate cutout cross design at its top backed with silver glitter to provide a shimmer through effect. A Fashioncraft exclusive, eachShining Cross frame has a 1 7/16” x 1 7/8” photo glass window and a slide out black craft back with easel for easy photo insertion. Also picture perfect as a place card frame, each comes in a white box with a cross design “For You” insert included.